Philly Teacher: So What is This #edchat Thing Anyway? For those of you who may have had your Twitter streams overwhelmed with tweets like these, here is a little explanation of how it 'goes down' every Tuesday (also know as #teachertuesday on Twitter). Every Tuesday educators all over the world participate in online discussions that take the form of a fast-paced chat room on Twitter. These chats often occur twice during the day--once in the afternoon and once in the evening. Usually there is a set topic (this past afternoon we discussed digital footprints: how we can teach our students about their digital footprint and maintain a positive one ourselves). The discussion centers around the topic, with people posing questions, responding to each other and retweeting statements, questions or ideas that they like. Participants tag their tweets with the tag #edchat so that anyone can follow the conversation. In order to better follow the conversation (it moves at lightning speed! ), many people use 3rd party Twitter apps like TweetDeck or HootSuite, Twhirl or TweetGrid (there are others, too!). In these applications you can create a search column for the hashtag. For instance, I use TweetDeck. ...and TweetDeck creates a column of all the live tweets that have the tag. I can then see what people are talking about even if I don't follow them. This allows me to read, respond to or retweet any tweet by anyone using the hashtag. ...and then reading the posts. The only problem with this way is that you need to refresh the search every few seconds to keep up with the conversation. TweetDeck and many other applications automatically refresh for you every minute or so. If you want to check the conversation out again without re-searching, you can save the search for later. So what is so special about #edchat? I find the fast pace discussion exciting. The varied opinions and points of view are enlightening, and the discussion is always deep and meaningful. Some might think of it as organized chaos, but it is just like sitting in a room of brilliant educators and never having to move around the room to hear everyone's conversations. What's even better, you can jump in at any time when you see a topic, statement or idea that grabs you or that you feel strongly about without feeling like you're interrupting a conversation. The #edchat discussions are also a great place to find like-minded educators to add to your PLN (Personal or Professional Learning Network). Often, after a session, you will find your email inbox full of people from the chat who found you on Twitter, and you can search them out as well to follow. How do these two kinds of #edchats compare? The second kind is more deliberate and planned, with contributors who are more connected with each other and with discussion that follows a timetable. The original #edchat of this type spanned 2 hours, which all agreed was a little too long, but it is a new endeavor in its early stages of development. There are many similarities between the two kinds of conversations. First, they are both centered around a topic of discussion. They also draw in new contributors while the chat is going on, and often they spark interest, with people tweeting as to what is going on and #edchat contributors drawing in followers by alerting them on how to follow the discussion. Once an #edchat is over, you might want to let out an exaggerated 'Whew!' Your mind is spinning with ideas, and the great conversations you've just had are alive in your brain. However, as time passes, and you think back to a conversation, you may feel need to go back and reread it. Unfortunately, tweets are not forever. For this reason, you may not be able to access the discussion through Twitter. For this reason, it is important to archive the conversation in some way. 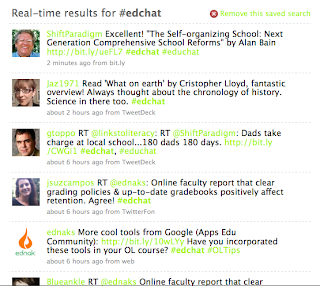 I archive all tweets that include the #edchat hashtag through TwapperKeeper (see the graphic at the top of this post). For a list of great archiving resources, check out this post by ReadWriteWeb- 10 Ways to Archive Your Tweets. Is the hashtag being used well? While I have thoroughly enjoyed the #edchat conversations of which I've been a part, I have noticed that when I do a search for #edchat, that people are using the tag to label all kinds of tweets about education. 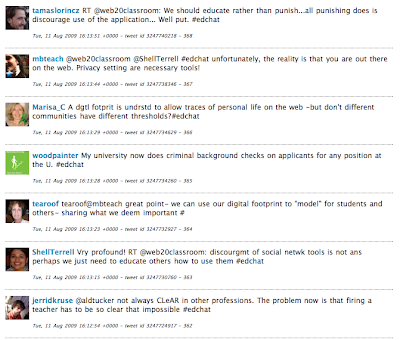 While this is their own choice, it has made archiving the #edchat conversations difficult. Most of the tweets that don't occur on Tuesdays should be tagged #education, not #edchat, since they are not part of a chat, but rather resources tied to education. You can see examples of this in my TweetDeck search above as well as in the Twitter search above. I think we as #edchat participants need to keep the hashtag to our discussions and limit its use to the actual conversations rather than letting it become a generic tag placed at the end of any tweet that references education. Is #edchat a successful endeavor? 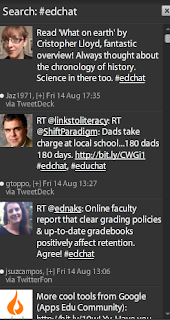 The #edchat conversations on Twitter are successful at connecting educators and spurring engaging debate and new ideas. Let's keep this wonderful tradition going by not making #edchat another generic tag. Let's preserve its use for actual live conversations to preserve the true definition of a "chat" and leave the rest of our tweets for other tags like #education or #edtech. I look forward to future #edchats and invite you to join in as well. I am planning on tweeting the time of the next chat as soon as I know when it is. Follow me on Twitter and help keep the tradition going by joining an #edchat and recommending that people reserve the tag for chats only. Also, thanks to The English Teacher Online for a great description of #teachertuesday! Nice new blog look and very thorough post! This was a great explanation, especially for someone new like me! Love the new look...thanks for the mention. I'm still learning so much about maneuvering through the Twitter world! This is an invaluable post for us noobs- Thanks! Very useful post. should bring in more for chats, discussion, and sharing. Thanks. Thank you- I have been wondering how to join in on the conversations and wasn't finding it easy. Now I'm ready to join in on the fun! Thanks for the link to your original post! It was very informative and helped me better understand your purpose behind the hashtag. Thanks to everyone for stopping by, and I'm glad you found it helpful. Hopefully, I'll see you all tomorrow for the next #edchat! Another great blog post by you; I am rarely online during the day, so I tend to miss out on a good number of hashtagged conversations. Your explanation was very good, and I hope to schedule some Tuesday-Twitter-Time soon so that maybe I can join in. I was happy to see you join the edchat last week! I hope to see you there again. Great post! Very informative and thorough! I'll definitely recommend it to those who are new to #edchat!